A white hot atmosphere is in prospect as Elland Road stages its biggest game of the season so far on Saturday evening. Top of the Sky Bet Championship table is at stake as Leeds United host a Norwich City side they have been battling it out with for leadership for the past three months. The Whites go into the Sky Sports live game with a three-point advantage, but their goal difference advantage is so minimal that any kind of defeat would mean they would have to hand over the top spot to the Canaries. 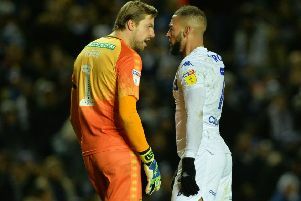 Playing for such high stakes was always going to make this a huge match, but with Norwich being named as one of the 11 Championship clubs trying to influence the EFL investigation into the “spygate” affair by writing a letter demanding times, dates and reports of every spying mission carried out by Leeds United this season they can expect to be met by a hostile reception from supporters. How they handle the occasion will go a long way to determining which of the promotion rivals gets the push they are looking for, but they need to be prepared for a bristling atmosphere. Leeds players handled a similar night well when they outplayed Derby County, although they are likely to find Norwich a more battle hardened team as they have fewer younger players in their team. It should be a cracking game for the purists with both sides playing attractive passing football this season. United have been handicapped by having players missing every week, but have never wavered from building from the back despite who the personnel have been. They have been hit by more bad news on the injury front with utility player Stuart Dallas out of action a further six weeks with an ankle injury just when he was returning from his previous knock. Key player Pablo Hernandez limped off at the end of the 2-1 win at Rotherham and will be monitored this week, wrapped in cotton wool maybe. However, the team could have a stronger look for the Norwich game with Pontus Jansson available again in defence after sitting out his one-match ban. Kalvin Phillips did well in the Swede’s absence at Rotherham, but would likely give way to talisman Jansson, who has been back to his best this season, and will be competing for a place back in the midfield. Elsewhere, first choice defender Barry Douglas, who has missed the last four matches, came through an under 23s game on Monday and is contention for a return to the side at left-back. But he faces a job to get back in with Ezgjan Alioski impressing after being moved back from the wing.